Laser eye surgery procedures like PRK and LASIK are excellent alternatives to glasses and contact lenses for patients suffering from myopia (nearsightedness), hyperopia (farsightedness), and astigmatism. With PRK and LASIK eye surgery in Springfield, the shape of the cornea can be permanently altered to provide enhanced vision. For most people who currently wear prescription lenses, vision correction with PRK or LASIK eye surgery offers the best chance of achieving 20/20 vision without any other form of treatment. To schedule a PRK, LASIK, Implantable Contact Lens surgery consultation, contact our office in Springfield, Massachusetts today. For people with nearsightedness (myopia), the eye is usually too long and the focus point is in front of the retina rather than directly on the retina, causing images to appear blurry. With LASIK and PRK, the cornea is easily modified to correct this problem by changing its shape. The shape change results in a flattening of the cornea, which counteracts the excessive length of the eye. However, for patients with severe cases of nearsightedness, LASIK and PRK may not be an option. The Papale Eye Center now offers a new procedure, lens implants, to treat patients with severe myopia. The experienced surgeons at Papale Eye Center can help you determine the best treatment to restore your vision. For people with farsightedness, the eye is usually too short and the focal point falls behind the retina. The cornea is made steeper with PRK or LASIK. For people with astigmatism, the cornea is normally “egg shaped” as opposed to round. To correct astigmatism, the cornea can be modified with the laser during PRK or LASIK surgery and reshaped to provide better focus. The goal of laser eye surgery is to change the shape of the cornea to improve focusing ability. To achieve this goal, surgeons use an excimer laser to sculpt corneal tissue. Because the laser is so precise, it can break down one microscopic layer of tissue at a time without affecting any surrounding tissue. In just minutes vision can be completely restored, and in just weeks, there is little or no evidence that any surgery has taken place! In traditional LASIK surgery, a thin flap is cut from the cornea’s surface in a way that leaves part of it still connected. It is gently folded back to expose the stroma, the next level of tissue. 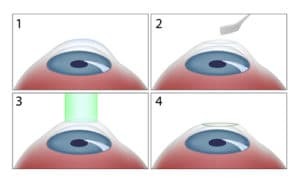 Then an excimer laser is directed precisely onto the tissue to vaporize tiny areas, thus removing irregularities that are causing defective vision. The little flap is then replaced and the eye heals itself in a day or two. Results are immediate and you can typically return to work the next day. PRK is similar to LASIK surgery in many ways, and both are effective treatments for nearsightedness, farsightedness, and astigmatism. The main difference between the two procedures has to do with healing and recovery. During PRK, the laser is applied directly to the epithelium, no flap is created – as a result, there is a slightly longer recovery period. The epithelium will heal in approximately two to three days, but in the interim, PRK patients will have to wear a bandage contact lens. Typically, patients with thin corneas are safer candidates for PRK surgery. Although the PRK recovery is longer than LASIK, this is a relatively small price to pay to enjoy quality visual outcomes. During your PRK or LASIK surgery screening at our Springfield, Massachusetts eye center, we will be able to give you a better idea of the kind of results you can expect with PRK and LASIK eye surgery. Who is a candidate for vision correction with LASIK surgery or PRK? Most levels of nearsightedness (myopia), farsightedness (hyperopia), and astigmatism will respond to LASIK surgery or PRK. As long as you are in good health and your prescription is stable, you will most likely be eligible for LASIK surgery. LASIK surgery is the procedure of choice for most of our patients, but we may also recommend PRK for individuals with corneal irregularities. Both procedures are considered extremely safe and both provide excellent results. Severely nearsighted patients are not candidates for LASIK surgery. The Papale Eye Center now offers a new procedure, lens implants, with options such as ICL to treat patients with severe myopia. If you are considering LASIK or PRK surgery, your first step is to schedule a free no-obligation LASIK consultation at our Springfield, Massachusetts practice. At the consultation, our qualified staff will answer all of your questions and will determine if you are a candidate for laser vision correction. If you wear contacts we request that you wear your glasses for the appointment or bring your glasses with you to the appointment. Once your LASIK candidacy has been determined, you will set up a comprehensive preoperative exam to meet with one of our LASIK surgeons. This comprehensive exam will last approximately two to three hours. The technicians will perform a series of painless tests of your eyes. Measurements for your surgery will also be taken at this exam. In order to obtain accurate measurements, we require that you discontinue wearing your contact lenses for at least 2 weeks prior to this appointment. If you wear hard contact lenses, we require you to discontinue use for a minimum of 4 weeks. Please note that your eyes will be dilated during this exam, so you will need to bring sunglasses and we recommend that you do not drive for long distances. You will meet with the surgeon at this appointment, and based on the measurements and tests performed, the surgeon will advise you as to which treatment is best for you. We want our patients to have the best and safest treatments, so it is possible that a patient may appear to be a candidate for LASIK surgery at the initial consultation, but after the comprehensive exam the doctor may find that a patient is not a safe candidate. Because your post-operative care is important to your healing and visual outcomes, please partner with your surgeon if you are planning to be out of town at any time the 2 weeks following your scheduled procedure. How will I feel after laser vision correction? Following LASIK surgery, patients can expect a short recovery period. There may be some discomfort for the first 12-48 hours after LASIK surgery or PRK. We encourage all patients to go home and rest. Your patient care kit contains medication to alleviate any discomfort should you experience it, and also has some ophthalmic drops we want you to take to promote healing and prevent infection. You may be required to wear a protective shield over your eyes for the first few nights following the procedure. We encourage you to wear dark eyeglasses if you experience sensitivity to bright lights. Post-operative corneal haze can result in glare at night from bright lights. Stable vision is normally achieved within one to six months. Most LASIK patients are able to return to work and other daily activities the day after the procedure. There is usually little to no postoperative discomfort after LASIK surgery and follow-up exams during recovery are required to ensure that your eyes heal properly. It is important to understand that while the risks of LASIK surgery and PRK are generally small, the exact healing response cannot be predicted in every individual. Following PRK surgery, you can expect some discomfort, potentially including irritated, burning eyes; light sensitivity; and tearing. Most of this discomfort can be attributed to the removal of the epithelium, which acts as a natural barrier between your eye and your environment. However, keep in mind that some patients experience little or even no discomfort during this time. Between two days and two weeks after your PRK, your vision may be blurred and hazy, but the discomfort of the first few days should be minimal. Between one and three months after your PRK, the new growth of epithelium over your treatment area will smooth and even out, producing clearer and clearer vision. Between three and six months after your PRK, your new vision should be stable, and you should be enjoying vision results equal to or in some cases better than patients with comparable prescriptions who had LASIK instead. Although the PRK recovery is longer than LASIK, this is a relatively small price to pay to enjoy quality visual outcomes. If you’ve been told that you’re not a candidate for LASIK… or if you’ve been waiting for a safe and effective technology that could eliminate your need for glasses or contacts – the Visian ICL, otherwise known as the implantable contact lens, could be right for you. Dr John Papale is one of the most experienced ophthalmologists in New England to perform this procedure. The Visian ICL is an Implantable Collamer Lens that works with the eye to correct vision. Unlike traditional contact lenses that go on the surface of the eye, the ICL is positioned inside the eye between the iris (the colored part of the eye) and the natural lens where it stays indefinitely. If your vision changes dramatically, however, it can be removed from the eye. There have been over 375,000 patient eyes treated worldwide with the Visian ICL. Papale Eye Center proudly provides patients from Springfield, Chicopee, Agawam, Longmeadow, Ludlow, and Westfield, MA with advanced LASIK eye surgery. Call (413) 782-0030 today to schedule an appointment!